A second former Blackwater contractor was sentenced to prison for involuntary manslaughter Monday in the 2009 shooting death of a civilian in Afghanistan. Justin Cannon of Corpus Christi, Texas, was sentenced to 30 months by U.S. District Judge Robert Doumar. A Virginia Beach man, Christopher Drotleff, received a 37-month sentence earlier this month for his actions in the same incident. The two were charged with murder and convicted of the lesser charge in March after an earlier trial ended in a hung jury. They are the first contractors for the Moyock, N.C.-based security company now known as Xe Services to get prison time for killing a civilian in a war zone. Rejecting defense attorneys’ plea for a lesser punishment, Doumar said the sentence was meant to send a message – especially to Xe. “They have a responsibility to hire individuals who they feel are capable of following orders and not going off on some tear,” he said. Doumar said he was unmoved by the defendants’ argument that their behavior should be excused because they were operating under dangerous conditions in a war zone. Cannon and Drotleff were working for a Blackwater subsidiary providing weapons training to the Afghan army under a Defense Department subcontract. The victim, Romal Mohammad Naiem, was a passenger in a Toyota Corolla that approached the scene after a two-vehicle Blackwater convoy was involved in a traffic accident in Kabul, the Afghan capital, on May 5, 2009. The two contractors fired some 30 rounds of ammunition into the rear of the Corolla as it drove away from the scene, according to testimony – Drotleff with a 9 mm pistol and Cannon with an AK-47 assault rifle. Their attorneys argued that they feared for their lives and fired in self-defense. A second Afghan civilian, who was walking along the road with a friend and a dog, was also killed in the incident, and the driver of the Corolla suffered disabling injuries. Drotleff and Cannon were acquitted of charges related to the pedestrian’s death and the driver’s injuries. Cannon’s sentence is within the recommended range according to federal sentencing guidelines. Prosecutors argued against any sentence reduction, saying Cannon behaved recklessly, failed to report the incident promptly and told an Afghan interpreter to lie about his alleged drinking earlier in the evening. Cannon came to court asking for concern and compassion, “but he offered none of that to his victims,” said Robert McGovern, one of the prosecutors. They also cited his military record. Cannon, 29, was discharged from the Army in 2005 after being absent without leave and testing positive for cocaine use, according to court papers. Federal public defender Larry Dash, one of Cannon’s attorneys, said Cannon has been declared 80 percent disabled by post-traumatic stress disorder and traumatic brain injury resulting from his military service. Unlike Drotleff, who made an emotional appeal for leniency at his sentencing, Cannon made no statement. His nearly nine months of pretrial detention will count against his sentence. He remains free on bond pending an appeal. 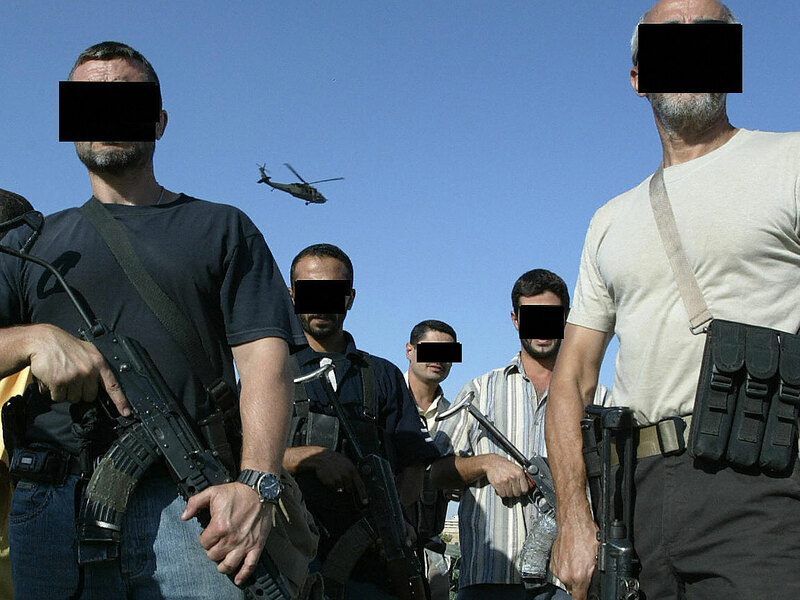 Four more former Blackwater contractors face manslaughter charges stemming from a 2007 shooting incident in Baghdad that left 17 Iraqi civilians dead. Adán Chávez, a physicist whose radical thinking has often been to the left of the president’s. CARACAS, Venezuela — To the many comparisons that can been made between Venezuela and Cuba — two close allies, both infused with revolutionary zeal, driven by movements that revere their leaders — consider one more: the presidential brother, stepping in during a time of illness. As President Hugo Chávez quietly recovers in Cuba after undergoing emergency surgery there more than two weeks ago, no government figure has occupied the political void created by his absence more assertively than his older brother, Adán Chávez, a physicist whose radical thinking has often been to the left of the president’s. He serves a role similar to that of Raúl Castro, who took over as Cuba’s president after illness removed Fidel Castro from the political scene in 2006. And like Raúl Castro, while Adán Chávez may lack his brother’s charisma, he remains a loyalist who has assisted his brother throughout the consolidation of power. A former Venezuelan ambassador to Cuba and long a member of Hugo Chávez’s inner circle of advisers, Adán Chávez has taken on the role of providing public updates on his brother’s convalescence, shuttling between Caracas and Havana in recent weeks. It was his disclosure last Wednesday that the president would not return to Venezuela for another 10 to 12 days that offered the most serious assessment yet of the president’s slow recovery. 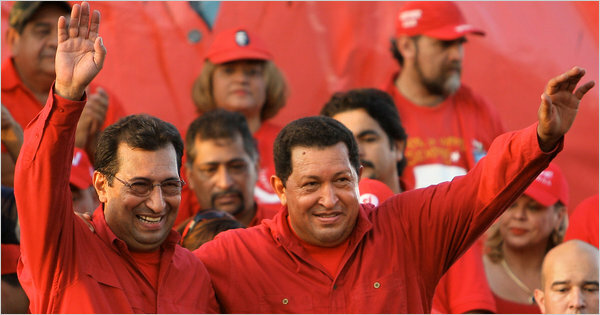 “It would be unforgivable to limit ourselves to only electoral or other methods of struggle,” said Adán Chávez, a former university professor involved in political activity long before his brother, who is less than two years his junior, formed a nationalist cell of young army officers in the late 1970s. Still, no one in the government, including Adán Chávez, has displayed the president’s visceral ability to connect with poor Venezuelans. That may not have mattered too much in Cuba, where the Communist Party holds unrivaled authority over the nation’s political system. But if Hugo Chávez is unable to quickly return to power in Venezuela, it remains to be seen how effectively his brother can hold off the spirited, if divided, opposition here and build support in a governing movement so centered around the president himself. Adán Chávez did not respond to interview requests. But biographers of Hugo Chávez attribute the president’s political evolution, if not his bruising political style, in part to Adán’s influence and ties in the 1970s with guerrilla leaders like Douglas Bravo, who advocated using Venezuela’s petroleum reserves as a tool for radical change. While Hugo Chávez grew close to Mr. Bravo and then broke with him, as he has done repeatedly with other mentors, the president still incorporated such thinking into his own ideology, using oil revenues as the driving force in his socialist-inspired revolution. Now, Mr. Bravo, 79, who is a critic of what he describes as Venezuela’s new dependence on countries like China and Russia, said Adán Chávez was clearly “in the line of succession.” Referring to Adán’s statement about using arms to defend his brother’s revolution, Mr. Bravo noted that neither the vice president nor any other prominent pro-Chávez political leader had said anything so provocative. “He must be receiving orientation from his brother to say such a thing, because I don’t think he would make such a declaration on his own,” said Mr. Bravo, who has known both men for decades. 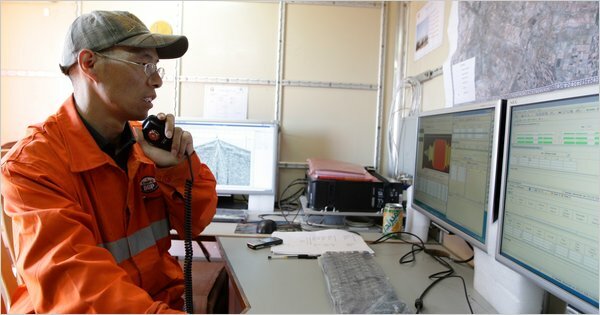 A China National Petroleum Corporation engineer working at Iraq’s Al Ahdab oil field. BEIJING — China’s largest oil company has begun operations at Al-Ahdab oil field in Iraq, making the field the first major new area to start production in Iraq in 20 years, according to an official news report on Tuesday. Operations began June 21, and the field is expected to produce three million tons of crude oil per year, reported China Daily, an official English-language newspaper. The oil field was discovered in 1979 and is believed to contain a billion barrels of crude. The Chinese company, the China National Petroleum Corporation, a state-owned enterprise, secured rights to the field under a technical services contract signed with the Iraqi government in November 2008. Under the contract, the company has development rights for 23 years, China Daily reported. It is investing $3 billion. The contract, the renegotiation of a deal first signed in 1996 with the government of Saddam Hussein, was postponed after the United Nations imposed economic sanctions on Iraq and the American military toppled Mr. Hussein in 2003. Analysts say the Ahdab operation is China National Petroleum’s largest in the Middle East. The contract stipulates that the company receive a fee for every barrel of oil produced, rather than an equity interest in the oil field, as it would have under the original agreement with Mr. Hussein’s government. A Chinese oil executive said in 2009 that the company would make a profit of less than one percent, but that the contract was a way to “get a foot in the door” of the Iraqi oil industry, which has much larger fields than Ahdab. The deal began drawing intense criticism from residents and officials in Wasit Province, where the field is located, shortly after the contract was signed. Some people demanded that Wasit be granted a royalty of $1 a barrel to improve access to clean water, health services, schools, roads and other public needs in the province, which is among Iraq’s poorest. The Iraqi government rejected the demands. Local residents complained in 2009 that Chinese development of the field would have no benefits for them, other than providing several hundred people with jobs as laborers and security guards for less than $600 a month. At the time, China National Petroleum said it was in an exploration phase and did not need much labor. Now, with the start of production, it is unclear whether the company has hired more residents. At the time, the 100 Chinese workers at the compound were too scared to leave the area for fear of being kidnapped. The Ahdab field’s estimated reserves are small by Iraq’s standards. The Rumaila field near the southern city of Basra, for which China National Petroleum and BP signed a development deal in June 2009, is Iraq’s largest oil field, with an estimated 17.8 billion barrels. Iraq as a whole is estimated to have reserves of more than 100 billion barrels. China’s energy needs have soared, and it has been scouring the world for energy sources. On Tuesday, President Omar Hassan al-Bashir of Sudan, in which China has large oil interests, arrived in Beijing for talks with Chinese leaders. Mr. Bashir faces indictment by the International Criminal Court on war crimes and genocide charges, but China is not obligated to arrest him because it is not a signatory to the Rome Statute that established the court. He is scheduled to meet President Hu Jintao on Wednesday. CHARLOTTETOWN — Lingering cold, wet weather is being blamed for a 30 per cent decrease in P.E.I.’s spring lobster catch. Ian MacPherson, executive director of the P.E.I. Fishermen’s Association, said Tuesday the bad weather has caused fishermen to lose a number of days on the water. As well, lobsters are not as active in colder water, and this has been one of the coldest springs on record. While catches have been low, prices have climbed during the course of the season to help ease some of the sting. MacPherson said prices are currently in the $4.75 to $5.00 range for canners and $5.25 to $5.50 for markets. However, he said higher costs for fuel and bait have made in another challenging year for fishermen. The numbers confirm what many people already suspected about this spring – April 1 to June 20 was cold and miserable. The National Weather Service last week said Kalispell set records for the lowest average high temperature and the fewest number of days above 70 degrees. The average high temperature for Kalispell was a paltry 57.6 degrees, a full degree lower than the previous mark of 58.8 degrees set in 1955. The average low temperature was 47 degrees, a tenth of a degree shy of the record average low of 46.9 degrees set in 1955. Kalispell also had just nine days where the temperature was 70 degrees or higher – an all-time record going back to 1899. It’s also been very wet. Kalispell saw 6.64 inches of rain – the 11th wettest spring on record. Weather forecasters say the cause of the cold, wet weather is the strongest La Nina recorded since 1988-1989. La Nina is a phenomena created when ocean waters near the equator cool near the South American coast through the central Pacific. This sets up a jet stream that steers weather systems over the northern Rockies. When the jet stream flows over the Rockies, Montana gets more storms, cold and rain. The same weather pattern also resulted in a record snowpack this year. Large Photograph by David Hartley/Rex USA. Insets: Top, © Ciao Pix; Bottom, From John Frost Newspapers. The August issue of Vanity Fair will be on newsstands in New York and L.A. on Thursday, June 30, and nationally on Tuesday, July 5. 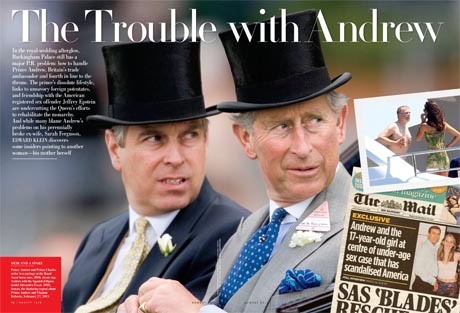 First, see V.F.’s chronology of Prince Andrew’s tabloid appearances here. Well, well. Now we know that the Duchess of York wears pink pyjamas and snores ‘loudly’. She talks to photographs of her daughters Beatrice and Eugenie, and sits on the end of her bed (shared with stuffed animals) and pretends to talk to the imaginary white rabbit Harvey, star of the Jimmy Stewart film. The pair still share the Queen Mother’s former home in Windsor Great Park, Royal Lodge, which, make no mistake, is now Fergie’s permanent home as well as Andrew’s — 15 years after their civilised divorce. One of her greatest pleasures there, she says, is walking in the woods ‘meditating on the bluebells’. But let’s leave the woods and look more closely at some of the other claims in this extraordinary book — subtitled A Duchess’s Journey To Find Herself — which begins its self-serving with her picture on the cover, her face air-brushed to that of a twentysomething. Fergie manages to plug an endless list of guru advisers and favourite destinations around the world. She also offers syrupy life-enhancing tips that she calls ‘Nuggets’ for anxious women like herself (‘See things differently; shine a light on those dark places in order for them to go away’). So let’s shine a light on some of her claims. Her assertion, for example, that as Andrew’s wife, she not only ‘loved being a princess’ but was ‘very good at it’. Not everyone will agree with this. Apart from the obvious fact that most people know her only as a duchess, not a princess, they will be reminded of her penchant for trotting around the globe with lovers during her marriage, on at least one occasion with small daughters in tow. Others will recall her flagrant misuse of her royal status — the ludicrous and costly helicopter flying course, abandoned when she became ‘bored’ with the lessons; those vast piles of luggage for trips across the Channel; the interminable shopping expeditions — and how it added to the tremors already imperilling the monarchy over Charles and Diana. Blind to reality, Sarah writes like a sullen child who still cannot understand why people called her names — in her case it was ‘Freebie Fergie’. ‘You might think that by marrying into the Royal Family my money worries should be over, that I would live solvently ever after in the bosom of one of the richest families in the world,’ she bleats. What she fails to mention is that their marital home at the time was a gift from the Queen and, unlike millions of other young couples, they didn’t have a mortgage to pay. That same Frugal Fergie spent herself into debts of £4 million in the Nineties and £5 million last year. Astonishingly, she also claims to have been a wide-eyed innocent who was ‘seriously close to bankruptcy’ last year when she was filmed offering ‘access’ to Prince Andrew for £500,000 to an ‘Indian business tycoon’ who turned out to be an undercover journalist. She says it wasn’t like that at all: ‘During our meeting (in his flat ‘in the Mayfair district of London’), I mentioned in passing that by doing business with me, he might get to meet Prince Andrew, because the Prince and I are a team. Under no circumstances did I offer to broker an introduction to my former husband, as it has been claimed. Blame or not, most people would shrink from bringing out this personal testimony so soon after such a ghastly episode had humiliated not just herself and Andrew, but also the Queen. They would lay low until the scandal subsided. Not Fergie. To her, the crisis simply opened up a business opportunity, one that she is now exploiting to the full. Hence her Finding Sarah series on her new friend Oprah Winfrey’s U.S. television channel and this, the accompanying book in which she paints herself as a permanent victim of life, crying out for sympathy virtually on every page. Even the flyleaf of the book describes how ‘her struggles with adversity have taught her that life’s lows can become a source of strength and courage’. Who would ever imagine that these tear-stained words refer to a woman who has been given every possible advantage in life, including marriage to a prince and the styling Her Royal Highness — all of which she has only herself to blame for throwing away. Blaming herself for her troubles, though, is something Fergie simply doesn’t do. While accepting that she is ‘flawed’, she inevitably lays the blame for this on someone else — surprisingly, her late mother Susan. This emerged during counselling with a Texan psychologist Dr Phil McGraw, which was arranged for the television series. As she writes: ‘During one of our sessions, a shameful story tumbled out: how, as a child, I survived a traumatic and turbulent childhood growing up in Britain. And on one occasion, she tied Sarah, who was on the potty, to the leg of a table while lunching with friends in the dining room next door. Dr Phil commented that ‘lashing a kid to a table . . . was not OK’. 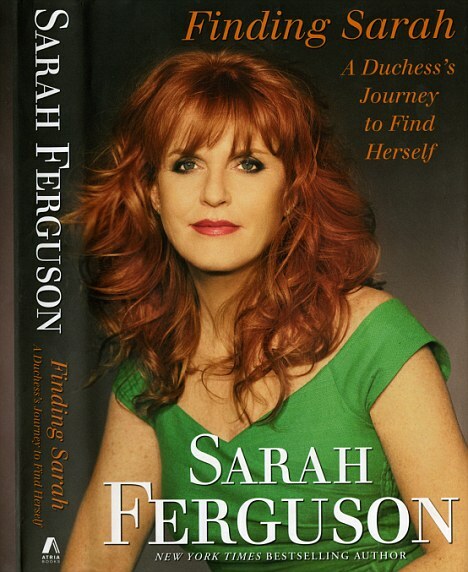 How very differently the Duchess of York described her mother — who was killed in a car crash in 1998 — in her first memoir, My Story, published in 1996, the year she and Andrew divorced.